California is a prime almond tree (Prunus dulcis) growing region since its long hot summers with low humidity and cool winters so closely matches that of its native land in western Asia. Sometimes referred to as "sweet almond" to distinguish the less bitter-tasting seeds from other almond tree species, the almond tree makes a pretty flowering tree for gardens. It needs companion almond trees nearby to increase pollination and to produce abundant fruit crops that yield the "nuts." Grow this plant in USDA hardiness zones six through eight. The almond tree belongs to the rose family, Rosaceae, and is a cousin to other important fruit crops like apricots, cherries, peaches and nectarines that all belong to the botanical genus Prunus. 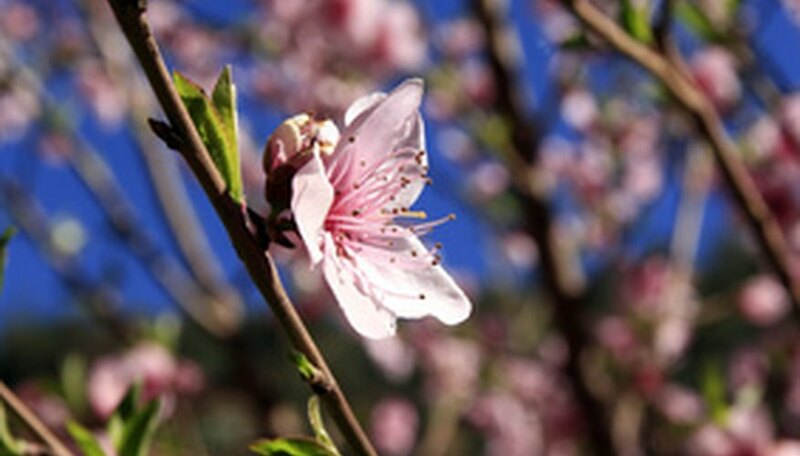 Within Prunus, the subgenus Amygdalus further groups them among more closely related plants, suggesting that almonds share a very close genetic ancestry with peaches, according to the University of Georgia. Almond trees likely were derived alongside peaches in South Central Asia before becoming a widespread deciduous tree species from Syria and Turkey to Pakistan, according to the University of Georgia. The first almond trees arrived in California in the 1700s thanks to the Spanish religious orders who settled the Mission at Santa Barbara. Around 1900, the commercial almond industry began in California, because of development of superior tree variety selections from the late 1800s. Since 1960, the industry and planted acreage of almond trees increased several-fold, making California the clear world leader in almond production. In 2002, over 500,000 acres of almond trees grew in California, making it the most widely planted tree crop in the state according to the University of Georgia. Spain, Italy, Syria and Iran are other commercial almond tree growing regions. Almond trees raised in orchards typically range from 15 to 20 feet in height although in the wild these winter-deciduous trees can mature to 25 to 30 feet with upright, spreading branches. In late winter or very early spring when frosts may still occur, pale pink or white five-petaled flowers don the branches and are pollinated by bees almost exclusively. After flowering, the lance-shaped dark green leaves emerge and mature, having many tiny teeth on their edges. The fruits are oval shaped and velvety green. The fruit of the almond tree is called a drupe and is like that of a peach but with key differences. Rather than having a juicy flesh or mesocarp, the almond fruit's flesh doesn't expand around the bony stone pit in the center. 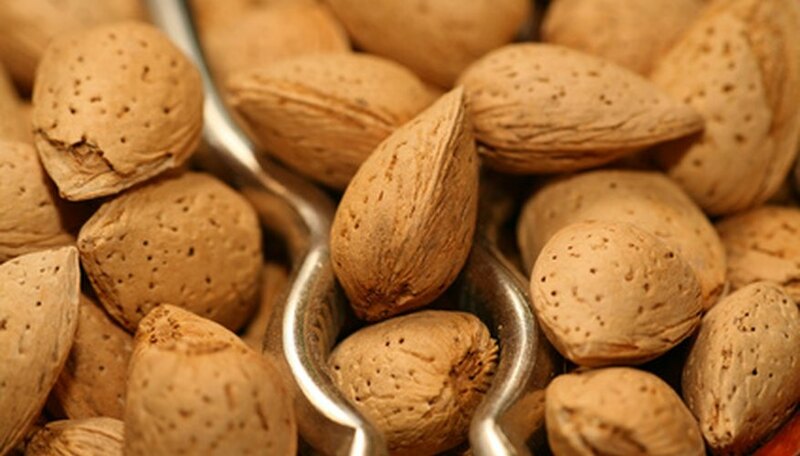 Botanically speaking, the almond we eat and consider a nut isn't a true nut at all--it actually is the seed. The stone pit in the almond must be cracked open to release the seed to be roasted before eating. These seeds contain a mild level of a cyanide-producing compound called amygdalin that provides the distinctive odor and flavor according to "Economic Botany: Plants in Our World." 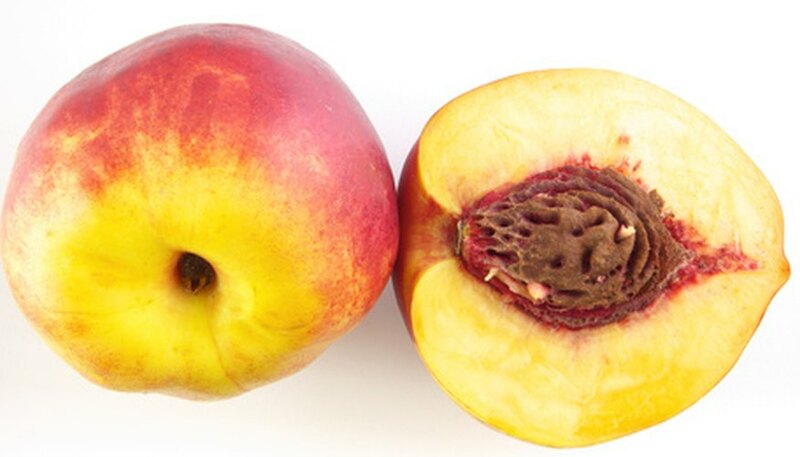 Peach and apricot seeds also contain this compound but in dangerously high amounts--the reason their seeds would taste extremely bitter and be toxic.